Anyway, back to the topic for this post. While during my trip to Tokyo, I got to visit this famous and magical tree house cafe that I saw from an episode on the Japanese variety show "Generation Tengoku" co-hosted by Yamapi. I fell in love with the place the first time I saw it and I told myself that I have to go there. Though finding out how to get there was a problem but then thanks to my awesome research skills (no really, I'm pretty good at finding info on Japan and how get around to places, lol) I found a blog with directions and the address on how to get to the place and it was just that simple! My friend and I went to the cafe at around 2pm and it was actually the BEST timing to go. Because close to about 4pm, the cafe actually lid up with beautiful lights surrounding the outside of the cafe and it was such a magical and romantic view! I didn't know that they had lights and it was a total surprise to me and I absolutely loved it! ♥ It was just pure luck and coincidence that I happened to see this and it totally made my trip there more worthwhile because I go to take pictures of the cafe both during the day and evening! =D I'd highly recommend you to do the same if you ever visit the cafe to enjoy it with full experience like I did. And in case you did not know, it actually gets dark pretty early in Japan. At about 4pm the sun would start setting and by 5pm the city is already dark. I was actually quite surprised by this fact when I was in Japan because I thought it would get dark much later like after 7pm or so. So just a little traveling tip, if you plan to visit Japan (especially during the fall) and want to explore places during the day, make sure you head out early to catch the daylight. So after my friend and I had our meal at the cafe, I went around to explore the tree house that was located outside of the cafe on the second floor. I didn't climb up to from the wooden stairway at the front, I entered through the balcony door on the second floor. I got to snap pictures of both before and after the lights were light up which I was super happy and excited about! XD The view from the second floor is pretty cool. Inside the tree house, there is even a wooden seat for you to sit and there's a sheet with pictures of the tree house and some plants and leaves written in Japanese which I couldn't read or understand what it says, lol. And then behind the balcony on the second floor, I discovered that there was this little tiny room called "Fleur Universelle" (part of the flower shop located on the first floor) which had some really interesting home decor and plants. I love how everything was made out of wood and the green plants surrounding the room just makes it so much like a magical garden house! There was actually two areas where you can eat at inside the tree house cafe. One was located on the second floor which is what it looks like in the two pictures above. And then there's an open patio area with the outside view located on the 3rd floor and that's where my friend and I both had our meal. So I had chance to visit the washroom which was also on the second floor because well, you know I always need to pee everywhere I go, lol. And I am glad I did use the washroom at the cafe because even the washroom design is so unique and special in its own way. There's a wooden sink with a metal petal at the bottom which you put your foot on top and step on it and water comes out from this wooden pipe. Very distinctive and unique unlike the typical kind of modern sink you see in normal restaurants or cafes. I forgot if the toilet was made out of wood too. I didn't take a pic of it and my memory is pretty blurry now as it's been quite some time so I don't recall what the toilet looks like anynore, lol. The dessert meal and drinks that my friend and I got! We actually ordered the exact same dessert which was some sponge cake with ice cream on top and this ghost shape cookie with whipped cream for Halloween which I thought was soooo cute, almost too cute to eat, lol. And I don't even remember what we ordered for the drinks. I think I got like a caramel latte while my friend got a mocha or something. All I remember was that the sponge cake and ice cream tasted pretty good! We both already had lunch earlier before we came to the cafe so we just ordered a small dessert to snack on. And on the first floor, there is actually this really beautiful flower shop with lots of plants and flowers. It is like a magical dream garden! If you are a garden/flower lover person like me, then you'd definitely love the flower shop. There was also this really great and stylish looking Japanese florist who was cutting flowers and arranging them for display. 2. Take the Exit 1 from the train station and turn right and then turn right again on the first small street. 3. Go straight and and continue straight down and you will find the tree house with this view in the pictures below and you know you have found the the place! It is super easy to find if you just follow those directions I have listed. The tree house cafe is not that hidden and you can easily find it without getting lost at all. I found the directions on how to get there from this amazing blog here. Check it out if you'd like to see more pictures of the tree house cafe that I did not take pictures of. 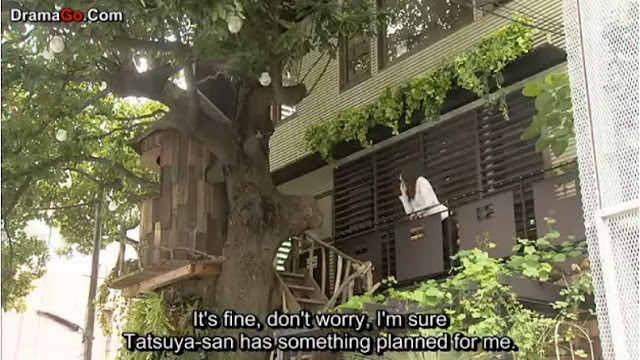 Additional note: I coincidentally happened to watch a drama called "Dear Sister" (which is actually a really great drama, btw) after I returned from my Tokyo trip and found out that the drama used the tree house cafe as a filming location! What are the odd chances?! Although in the actual drama they only filmed outside of the cafe because the inside is actually really tiny and it would be impossible for them to film inside it. 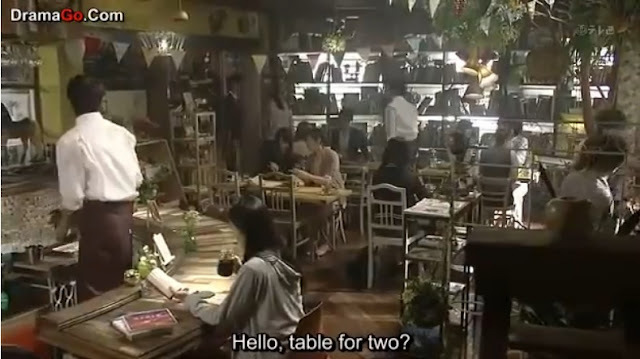 So instead they created a "fake" drama set of what the cafe looks like inside, lol. And the "fake" drama studio set for the inside of the tree house cafe created for the drama, lol. The drama version makes the tree house cafe looks much more bigger and spacious than it actually is at the real tree house cafe. Labels: fleur universelle, flower shop, japan, les grands arbres, magical tree house, minato, tokyo, tokyo trip october 2014, travel, tree house cafe, レ・グランザルブル.